Living in Ontario means we are provided with unlimited amounts of stunning locations for photo shoots, but some shooting locations stand out among the rest. 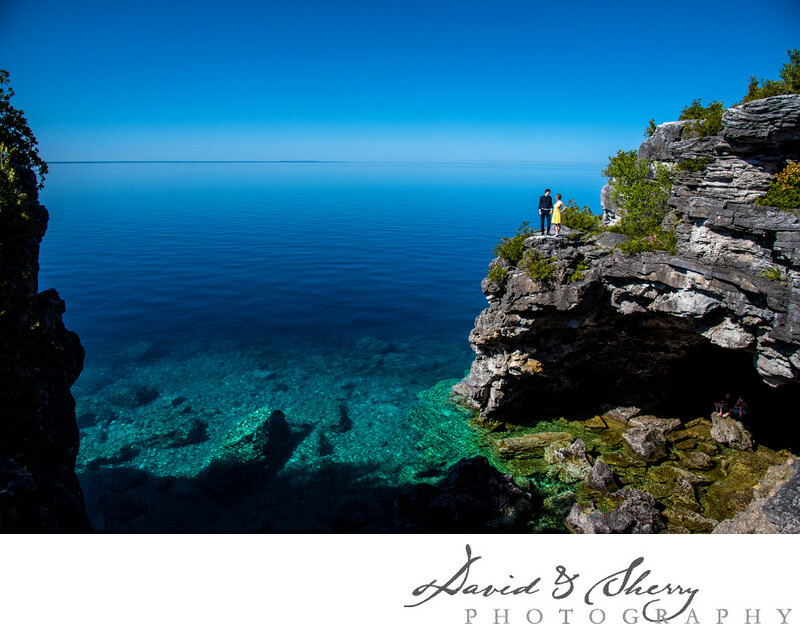 At the top of the Bruce Peninsula is the lakeside town of Tobermory. This quaint town is surrounded by crystal clear water, and lavish National Parks. It also contains the Niagara Escarpment, Flowerpot Island, and last but not least, the beautiful grotto. The grotto offers multiple opportunities for Couplescapes with its rock caves, cliff views, and of course, clear blue water. Many photographers would agree that this area is a jackpot when it comes to shooting an engagement or wedding. The town of Tobermory has become known Canada-wide because of the grotto’s scenic beauty. We were lucky to arrive at the grotto on a day when it was sunny, warm, and unpopulated. Therefore, it looks as though the bride and groom are enjoying a moment alone, while exploring the area and admiring the scenic view. This Couplescape covers all aspects of the landscape and scenery. The greenery, caves, rocks, and cliffs are all featured in the shot, but the most beautiful part of the setting is the many shades of blue water that fade into the cloudless sky.